The Russian military knew about the patrol route, the NSDC secretary says. The military and political leadership of the Russian Federation are responsible for the death of a member of the OSCE Special Mission (US citizen) and the wounding of two mission monitors (citizens of Germany and the Czech Republic), NSDC Secretary Oleksandr Turchynov says. "[The blowing-up of the OSCE car] is a planned terrorist act directed against the OSCE Mission in Donbas. It is the responsibility of the military-political leadership of the Russian Federation, which controls the occupied territory of Donbas. No actions of the hybrid forces occur without the knowledge of the Russian General Staff, " reads Turchynov's statement on the site of the National Security and Defense Council. Turchynov is convinced that one of the cars of the OSCE SMM patrol was blown up by a landmine planted by militants of Russian-terrorist groups. "The blowing up of the OSCE CMM car was aimed at the impeding the patrolling of the occupied territory to veil massive and uncontrolled movement of Russian weapons and military equipment for further large-scale military provocations," Turchynov said. According to him, the Russian military representatives to the SSCC and the illegal military formations controlled by them, who provided appropriate security guarantees to the OSCE representatives, have been notified of the route of the OSCE representatives' route. 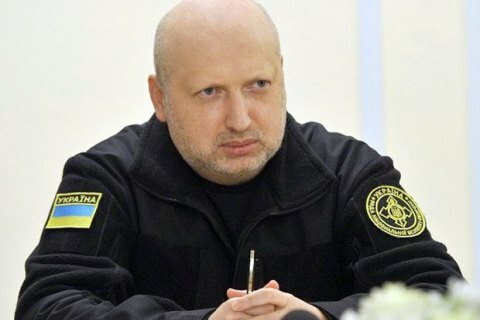 The SMM patrol did not deviate from the planned route, Turchynov added. In his view, the statement by Russian Foreign Minister Sergey Lavrov on "the need to immediately search for the perpetrators" is blasphemous and cynical, "because the perpetrators of this terrorist attack are in the Kremlin and are fully responsible for the blood of the OSCE monitors and Ukrainian military and civilians, who have for three years been dying in Donbass because of the aggression of the Russian Federation." On Sunday, the car of OSCE observers was blown up at a landmine in the area of the village of Pryshyb (territory controlled by the LPR militants). As a result of the explosion, a mission employee, a US citizen, was killed, and two more - a citizen of the Czech Republic and a German citizen - were wounded. President Petro Poroshenko urged a thorough investigation into the incident. The president stressed that observers should have unimpeded access for monitoring in the ATO zone. The Ukrainian foreign ministry condemned the incident as Russia's attempt to intimidate OSCE monitors. The US State Department called on Russia to influence the Donbas militants it support to make them first steps towards peace restoration. The OSCE said it will continue working in Donbass despite the incident. Russia to supply electricity to "DPR"